"Good Simple Advice on Adapting Game to College"
If you're at college and particularly if you're new to it or frustrated by it, the advice in this book is very helpful and down to earht. It will help you build up a good social life and use that to get more success with the girls at college. It doesn't teach you the basics of attracting women or confidence and inner game - those are something you'll have to learn before you take advantage of this. Don't expect a lot of examples or details of exactly what to do in this book - it has more advice on the spirit of what to do rather than the exact actions. This is a pretty nice intro into social circle game, in particular for college, for beginners. It emphasizes the important points frequently throughout the book and is a fun read thanks to the laid back writing style. It was one of the first books to be written on the subject. Overall the advice in this book is all good and practical. It doesn't contain any super groundbreaking concepts. 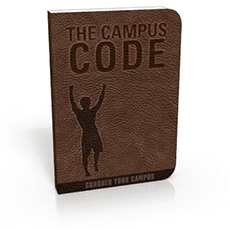 The value in this book is getting you to focus on the practical activities and the mindsets (ways of looking at college life and how you should approach it). If you apply them with energy they will work for you. The writer puts a good energy into the book - which will help to motivate some people. Applying the advice will take energy and effort, and most probably changing your habits and what you typically spend your time doing at college. It goes without saying that if you aren't prepared to do those things - then don't expect to get the results. This is a light read because Mark Redman has a pretty laid back writing style which tends to inject a bit of fun and humor in from time to time. This makes it easier reading than some of the more technical and deeper dating manuals - it is also a reflection on the style of advice. Simple and practical. As a result if you're at an advanced level, with a lot of experience or have read a lot, and are into a lot of detail and strategizing this isn't going to be for you. You'll get little from it. A Concern - How Do You Need to Learn? If you're someone who likes to learn with a lot of specific rules and techniques and ways to do things this isn't a book for you. It is not detail orientated, and expects you to get the gist of things and apply them in the detail yourself. It provides general guidelines and general ideas and expects you to be able to get down to the details. For this reason its an ideal book for someone who already has experience with game but doesn't understand 'social circle game' or is getting frustrated with his game not working on the college campus. It would also be useful for someone who is just starting out learning about dating and who is on colledge campus - it gives you an intro into what sort of things you'll learn about approaching women that aren't going to work well on a college campus. That could help you avoid a lot of problems if that is your situation. The book goes into a bit of detail about the workings of campus life in the U.S. such as fraternities, sororities and generalizations about the girls in each year. Be careful how you use these generalizations as they are stereotypes - useful in many cases, but not all of them. If you are outside the U.S. some of the cultural details won't be relevant to you, but in most countries there are similarities - or similar structures so you should be able to get some value from these sections by thinking a bit about how they reflect on your specific situation. The general rules of course remain the same to a large extent - college and university has many commonalities all over the world. This is a relatively basic book and unfortunately where the author talks about situations that he navigated that could have offered 'high level advice' he washes over them without providing much detail or specific pointers. It leaves you feeling that there is more to learn. Having said that, if you apply the 80/20 rule - the material in this book is already most of what you need - it just doesn't contain the top spire. It doesn't teach you the basics of attracting women or areas like confidence and inner game - those are something you'll also have to learn to make the most of this.